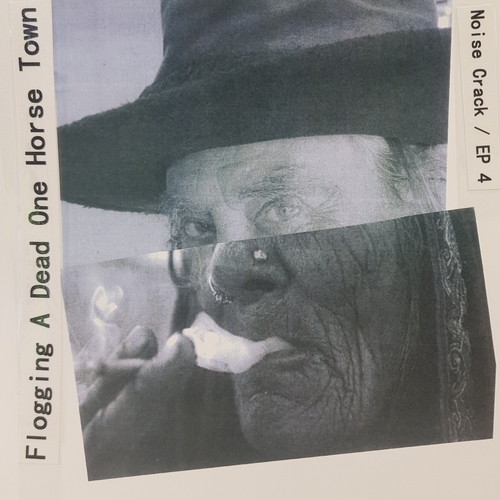 After the underground success of their previous EP, "Listening Will Cause Death", trans-island duo Flogging A Dead One Horse Town prove themselves a little more accessible with "Noise Crack / EP 4", out now through MUZAI Records. We blame their newfound "fame" on their concrete-pop sound they cultivated and captured in the earlier part of 2018. The trademark guttural bass riffs, replete with fuzz, create a more pop-twinged element throughout the EP. It's still post-punk, but post-punk with a certain groove to it. Dave's motorik drum beats certainly evoke a rhythmic, almost instinctive need to nod along to track such as "Post No. 8 Wire Post" and single "Doorway. Driveway. Road. Tree". The deadpan vocal delivery once again from Tim ensured that their post-punk foundations are not eschewed for a "pop" hit. Flogging A Dead One Horse Town - Doorways. Driveways. Roads. Trees.